It was Mother's Day and my request was for the family to join me in a party. A Quinoa "Build-a-Bowl" Party. Right now you're probably muttering to yourself just like my family members did, "why, and um...why, and really?" Yes, I can be a bit of a food nerd. But, I was so convinced that if they could just experience the flavors, the nuttiness, and the ease of this "perfect" grain they would fall in love with it, too. I'm not saying that Quinoa (Keenwa, Kinwa) can solve all the health problems in the world, but it's a start, people...it's a start. The United Nations has named 2013 the International Year of Quinoa. This ancient cereal contains 18% protein along with fiber, magnesium and iron. It even has calcium, making it a great choice for vegans. It's naturally Gluten Free and is one of the simplest foods to cook, ever. Quinoa can be cooked like rice, or Quinoa flour can be used in baking and pasta, or the grains can be used in everything from baked goods to breakfast foods. Gimme a flag, I'm ready to march! I discovered Quinoa in cooking school when one of my favorite Chef instructors said, "If you're on an island and you can have only one food, pick Quinoa because it's the perfect grain." Then we cooked some and it was bitter and I was so confounded. Did healthy have to be so bad tasting? As it turned out, we had bulk Quinoa which needs to be rinsed to get the natural coating off of the grain that makes it bitter to taste and (hello, perfect universe) keeps the birds from eating it before it's harvested. When we cooked it correctly, I became a self-appointed ambassador. Most Quinoa sold in stores has already been pre-washed and the instructions will guide you to just give it a quick rinse before cooking. I recommend that for rice and all grains. I'm convinced that anyone who thinks they don't like Quinoa has simply not found the way they like it. Perhaps they cooked it in unseasoned water, then judged it to be bland. It's a food canvas that takes on the flavors you bring to the whole picture. 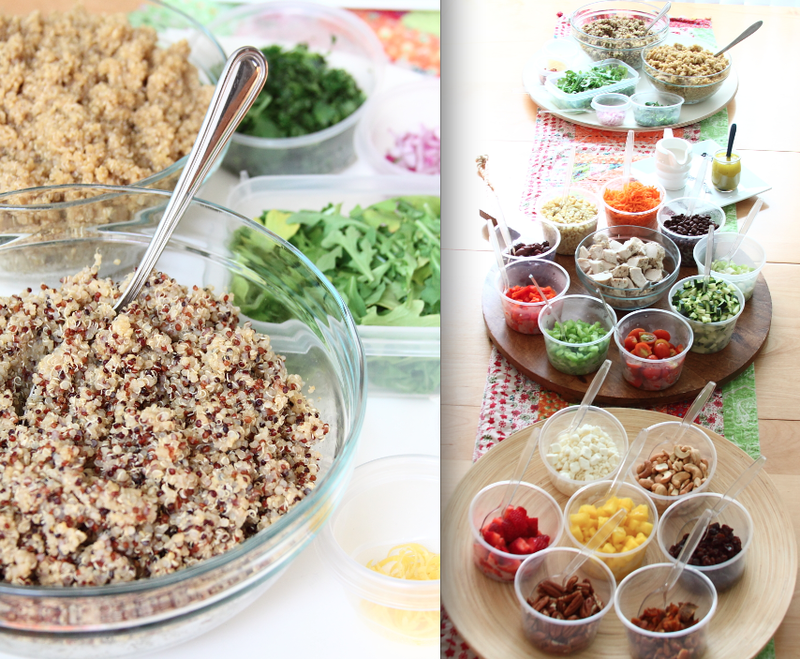 At the Quinoa Build-a-Bowl party, I put out tons of choices to mix and match, toss and turn, and pick and nibble. At one end of the table there were two choices of Quinoa. Both had been cooked in Vegetable Stock. The Red Quinoa Mixed was warmer with a toasty bite. I included fruits and nuts to show just how different Quinoa can be used. My daughter eats Quinoa for breakfast, warmed with fruits and Almond milk. To toss in or drizzle over the Quinoa, I made two different pours: Honey Lime Cumin Vinaigrette and a Cinnamon Coconut Milk. After my little spiel about my "love for Quinoa", I let them party with simple directions to start with some Quinoa and then just have fun, you know, "building-a-bowl". We had some wine, some waters, some music going and a lot of jokes (mostly at my expense) flying around the room. I'm not kidding you, the buffet table was almost empty at the end of this meal. For as much "guff" as I took, I also watched every single person return to that table to try another combination. My Firefighter, 6'3" son who listened to my preaching with a patronizing grin admitted that he couldn't stop eating "this stuff." The conversation around the table turned into recommendations for the "perfect" bowl, and the right time to "garnish". They actually said the word, garnish. Which means they listened to me. Huge Mother's Day gift. So, maybe you don't need to have a whole party to try some of these combinations (although it was seriously fun.) I just hope that your "take away" from my recap is a sense of confidence that you can create a wonderful, healthy and simply delicious meal from Quinoa. And, no, I haven't been compensated or sponsored by any National board for the Inca Indian grain that is so mispronounced called, Quinoa. Like I said, I'm a bit of a food nerd and I just love making you a star in your own kitchen. 1) After rinsing the Quinoa and draining it, pour it into a saucepan with the liquid. 2) Bring to a bowl, season, then lower the heat to a simmer. Cover and Cook for about 15-20 minutes until the little grains sprout. Check after 15 minutes. 3) Fluff with a fork and serve warm, or cool and then keep in refrigerator for up to several days and use as needed in recipes. 1) Whisk the honey and lime juice together. 2) Whisk the cumin and olive oil together. 1) Pour the milk into a small sauce pan, add the cinnamon stick and bring to an almost simmer over low/med. heat. 2) Remove from the heat, cover and allow to infuse for at least 15-20 minutes. 3) Remove the cinnamon stick and chill the milk or serve warm. I WANT to like it too, Cathy, but so far no luck! I tried mixing a little quinoa flour when I made bread once, and we all tasted it and did not like that either :( Are we hopeless? Great idea, and definitely the perfect Mother's Day gift. I love quinoa, so I would happily have gobbled up huge bowls of it. This was the best! I was a fan of keenwah before but this makes me wanna carry a flag too. Delicious. Can wait to make s a small build a bowl party for this weeks dinner. This is such a fun idea!!!! I love it! I love quinoa. Never thought of having it for breakfast. To be clear, you make the quinoa w coconut milk and then when it's time for breakfast, you just add a little almond milk, fruit and warm it up? Also, what fruits tastes the best? Peaches? Looks like a fun idea. My husband and I are moving and this might be a fund going away party idea. Fairly easy, healthy and appealing to the veg and non-veg crowd I hope. I, too, have had a hard time liking quinoa. I saw you on Home & Family today and thought I'd try this recipe. I made the savory version and let me tell you it was delish! I'm now a fan! Can't wait to try cooking it in coconut milk!